Laparoscopic total extraperitoneal peritoneal (TEP) repair has become increasingly popular since its introduction. The purpose of this study is to establish the safety and feasibility of TEP in elderly patients compared to that in younger patients. The clinical records of patients who received TEP hernia repair from August 2007 to September 2016 were reviewed. The patients were categorized into two groups: younger than 70 and 70 years or older. The patient demographics, operative time, estimated blood loss, rate of open conversion, complications, length of hospital stay, rate of readmission, rate of recurrence were compared. A total of 425 cases were documented. 317 (74.6%) patients were younger than 70 years and 108 (25.4%) were 70 years or older. The mean ages were 51.6 years in the younger group and 75.3 years in the older group. Co-morbidities (34.0% vs 72.2%, p = 0.000) and ASA score III and IV (4.1% vs. 6.5%, p value = 0.000) were more common in the elderly group. 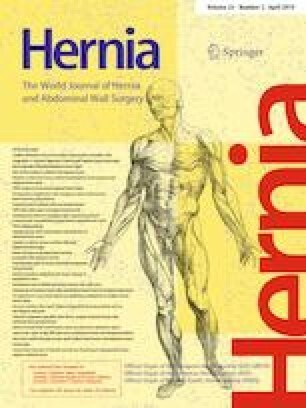 There were no significant differences between the two groups in the percentage of history of previous surgery in the lower abdominal region (23.9% vs 29.6%, p = 0.292), overall complications (7.2% vs 12.7%, p value = 0.177), and anesthesia-related complications (0% vs 1%, p value = 0.617). The operative time was similar between the two groups (54.3 vs 57.1 p = 0.220). The length of hospital stay (2.7 vs 3.0, p = 0.022) was longer in the elderly group. Laparoscopic TEP hernia repair can be performed safely in elderly patients without differences in perioperative complications and recurrence rate compared to that in a younger population despite a longer hospital stay. Ethical approval was agreed by the ethical committee of our institution (IRB File No. 2018-12-0003). For this retrospective review, formal consent is not required.